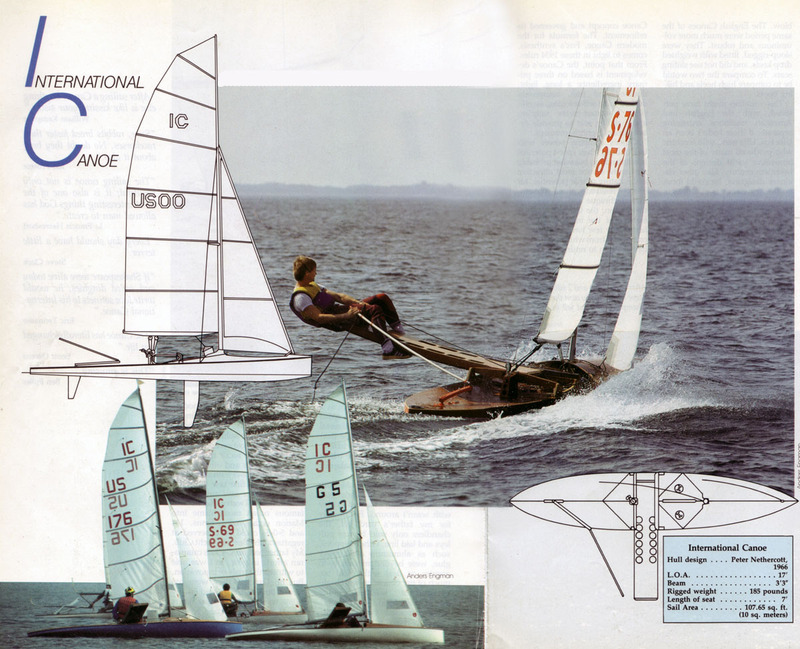 By the mid 1980s, I has been sailing for a while, beginning with Flying Juniors and Lasers in Vancouver, and extending eventually to anything I could cadge a ride on, including a Chinese junk and a Bristol Channel Pilot Cutter. I was browsing in a bookstore, looking for something boat-related to spend that week’s grocery money on, when I picked up the April 1985 issue of The Yacht. I think it’s folded now, but at the time it was a glossy, swanky publication with wonderful photography. Paging through it, I came across page 94, which carried an article by Steve Clark entitled “The International Canoe: Mercurial Fantasy.” I can’t honestly recall if I’d ever really thought too much about sailing canoes before that moment, but reading Steve’s article fixed that pretty quickly. The image above smacked me between the eyes just like the handle of the rake that you left lying in the back yard, and I haven’t been the same since. I mean, how could you look at that old-school Swedish IC photo and not want to go do that right away. Planing to windward, the skipper is perched at the end of his sliding seat, perfectly balanced (for the moment) between his rig (a foil in the air) and his centerboard (a foil in the water) with only a little hull between the two. All of a sudden, I needed to know more about canoe sailing, and about International Canoes in particular. I posted a message to rec.boats [remember Usenet?] asking for anyone who could provide some information about these wonderful boats, and maybe help me find one of my own. Replies came back from a couple of stalwarts of the Chesapeake Bay IC community [one of whom, sailmaker and Moth afficionado Rod Mincher, runs a great sailing blog of his own]. Some chatting back and forth did nothing to diminish my enthusiasm. The grapevine told me that there was a boat located just outside NY City that might be available. Its owner had recently passed away, and his widow was cleaning out the garage. It was IC US 78, a Lou Whitman Manana II design. 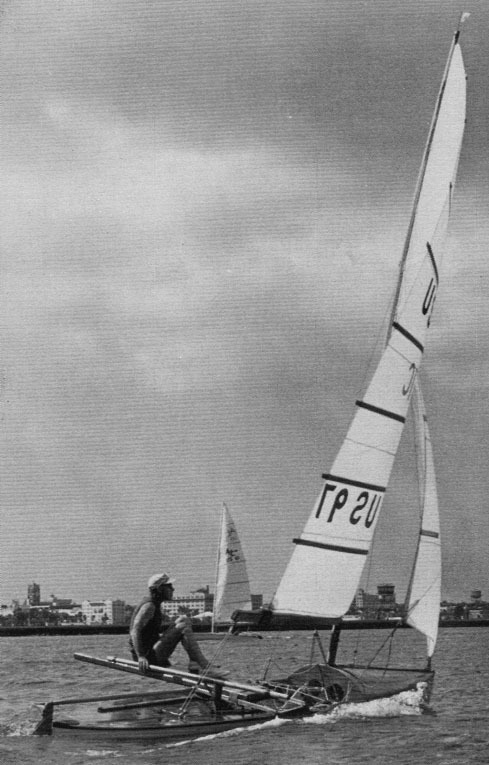 Here’s Lou aboard one of his boats off City Island in the 1960s. So, off I went down to New York City to have a look (just a look, mind you, I wasn’t going to buy it. . .) at this canoe. As I drove south, I was thinking of what Steve Clark had said at the end of his article. Canoes combine power with lack of drag. Their speed potential is outstanding, but what probably makes the Canoe most attractive is the nature of that potential, for it is not realized without consummate technique and finesse. For this reason, the Canoe lives on a frontier of the imagination that historically few have ventured to cross, and from which even fewer have chosen to return. What I saw when I arrived at the house in the shadow of the George Washington Bridge was a very tired boat that had been outdoors a little too long. The Manana hulls had been produced by Max Andersson in Sweden, who was normally a builder of racing canoes and kayaks. In the technology of the 1950s, they were hot-moulded, laid up from layers of veneer adhered with resorcinol glue which had to be cured by heat and pressure in an autoclave. This produced a light, strong frameless hull with one great disadvantage: it didn’t age well. By the time I saw US 78, she had been sitting out in the back yard for too long, and water had gotten into the veneer seams on the bottom. The result looked like an old head of Savoy cabbage, with the veneers sprung up in all directions. Nevertheless, I loaded her on top of the truck, along with all the gear and a nice piece of stained oak which the sailor’s widow thought was part of the boat but which was really the center leaf from an old dining room table, and headed back north. What I didn’t take, and I regret it to this day, was the William English paddling canoe that was hanging overhead in the garage, and was in much better shape. I only had room for one boat on the truck, though, and I had IC on the brain. Now I had one in my hands, too. I ended the last post by introducing Charles P. Kunhardt (1848? 1849? – 1889), another of the titans of late 19th century American yachting. In a short life of 40 or 41 years, he produced a tremendous body of work, and one can only wonder at what might have been accomplished had he not perished in a shipwreck long before his time. He was born only a few years before W.P. Stephens, his fellow traveller in the world of yachting and boating. Kunhardt was the Yachting editor of Forest & Stream from 1878 to 1884. W.P. Stephens had become the journal’s Canoeing editor in 1883, and added Yachting to his portfolio after Kunhardt’s departure. I’ve thought quite a bit about an analogous early 21st century publication that I could cite to give an idea of the influence and importance of Forest & Stream to the late 19th century sporting world, but I’ve come up short. Sports Illustrated doesn’t even come close. In its densely-packed pages, set in eye-strainingly small type, this weekly journal (and its English equivalent, The Field, covered the whole of the sporting world, from the turf, to shooting sports, to canoeing, yachting and later bicyling. It was quite simply the publication of record, and it afforded Kunhardt the perfect pulpit from which to preach. And preach he did, for he was a yachtsman and designer of decidly strong opinions, and a polemicist of fierce and deadly skill. A proponent of wholesome and seaworthy yachts, he advocated English-style cutters over the then popular wide, shallow American centerboarders. So fiercely did he argue the virtues of the cutter type that he became the unofficial leader of the whole faction, dubbed the “Cutter Cranks” by fans of other types. A number of his letters to W.P. Stephens survive in the W.P. Stephens collection in the archives of Mystic Seaport, many written in a purplish-colored pencil. Reading them, one can imagine him writing furiously, the words pouring out onto the page, as he argued a point of design doctrine or demolished a foolish opponent or poorly-designed yacht. In addition to vast numbers of articles and editorials, Kunhardt was a prolific designer of yachts and small boats, and a draftsman of remarkable skill. Let’s take a moment of silence and admire his work on the inboard profile of the cutter yacht Yolande. This is beautiful drafting work, executed on glazed linen sheets with a ruling pen that had to be charged anew with ink for each line that was drawn. Work like this represents hundreds of hours of patient effort, with the whole project hanging in the balance, always on the verge of being spoilt by a single blot. There is life in this drawing, and it’s not hard at all to picture oneself snug below or preparing a hot drink in the galley, located in the 19th century fashion up in the eyes of the boat and not aft at the foot of the companionway. Yolande‘s deck plan is just as nicely delineated. Note how fastidiously the shadowing under the deck furniture is drawn, and the care taken to show the button tufting in the settee cushions, and the harlequin pattern of the linoleum on the sole of the saloon. These drawings, and much much more of Kunhardt’s impeccable drafting and pungent prose, can be enjoyed in his book Small Yachts: Their Design and Construction Exemplified by the Ruling Types of Modern Practice. If your pocketbook will stand it, find and buy an original copy of this remarkable book, and leave it open on the reading stand in your library to a different yacht each week. You may want to consider a loan, though, as such quality doesn’t come cheap. In 1997, a first edition sold for more than $1000 at auction in the UK. If that’s a little too rich for your blood, by all means enjoy WoodenBoat magazine’s edited and abridged paperback edition from 1985. In either case, reading Kunhardt is a bracing way to immerse yourself in the fascinating world of late 19th century yachting and pick up some of the flavor of the times. If W.P. Stephens had written only Canoe and Boat Building: A Manual for Amateurs, his place in boating history would be secure. He clinched his nomination for the all-time boating hall of fame, however, with Traditions and Memories of American Yachting. 1981 edition by International Marine Publishing Company is on the right; the 1989 edition by WoodenBoat magazine is on the left. In offering this book to my fellow yachtsmen I feel that a few words of explanation or excuse are necessary: first, for the absence of formal style which is usually found in the recording of serious history; and secondly, for the lack of chronological order. . .The method of narration which suggested itself as the most fitting is that pursued by yachtsmen about the fire in winter and afloat or on the club porch in the season–reminiscent, discursive, argumentative, often wandering from the immediate subject. We all have reason to be thankful that Stephens went about writing these articles in his own style, for the manner in which they are presented is thoroughly charming, and the side tracks and digressions, which are, after all, the way that history proceeds, are nothing that cannot be surmounted by the use of the very complete index. The articles were collected and published in a book several times, with the most complete collection brought out in 1981 by International Marine Publishing Company. In 1989, WoodenBoat magazine performed a great service to yachting and boating history by bringing out a new and comprehensive edition on the 50th anniversary of Stephens’ death. All of the previous collections had been printed exactly as they originally appeared in the magazine. For the new edition, WoodenBoat re-set the articles in new type and devoted considerable effort to sourcing originals of the illustrations used in the articles, and added some 40 new images. And what is in this wonderful book? Just about anything you could want to know about North American yachting and boating, from the sport’s beginnings in the middle of the 19th century, through the epic era of the America‘s Cup, to the great sloop vs. cutter and keel vs. centerboard debates to sandbaggers, catboats and of course, sailing canoes and canoe yawls. The book is profusely illustrated with lines plans, sail plans, general arrangement drawings, photographs, engravings and paintings. As you page through the many drawings, you will from time to time see one of exceptional quality, such as this arrangement plan of the cutter Yolande. Close examination of the finest examples of draughting in the book will often reveal the initials “C.P.K.” somewhere on the right-hand side of the drawing. Those stand for Charles P. Kunhardt. And who was he? Well, that’s another book. Until then. . .
I’m going to take a break from writing about the restoration of the Old Town sailing canoe to talk about some boating books. 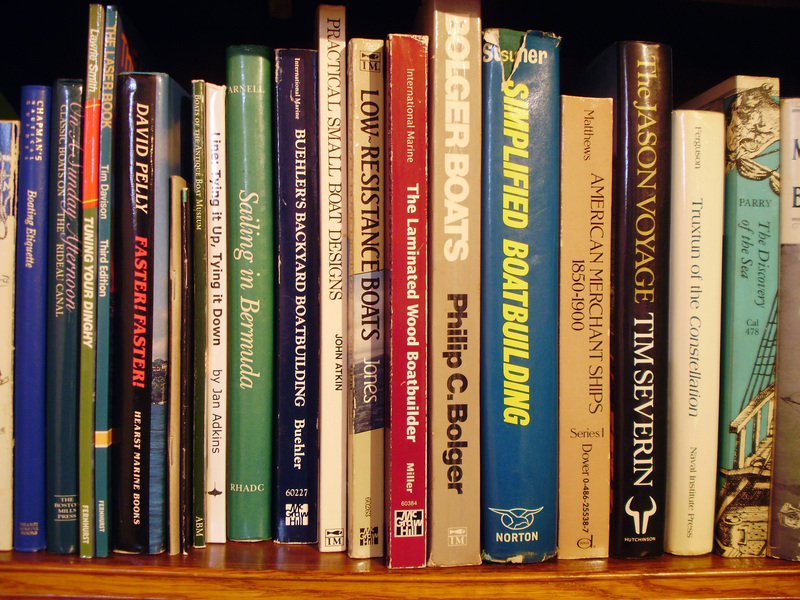 Reading books about boats and boating (and buying books about boats and boating!!) is something I enjoy almost as much as boats themselves. Turning away from my desk to look over my bookshelves, I’ve made a quick selection of some volumes I think are worth talking about. At the top of my list are works by William Piccard Stephens. Better known as W.P., Stephens (1854-1946) is one of the giant figures in late 19th and early to mid 20th century boating. A true polymath, Stephens participated in his chosen sports as a builder, designer, yachtsman, editor and writer. Among his most enduring contributions to yachting and boating are his written works. Over the course of hundreds of thousands of words, he performed an invaluable service by documenting the history of North American yachting and boating, working from both meticulous research and considerable first-hand knowledge and experience. My favourite book of his, hands down, is Canoe and Boat Building, or, to give its full magnificent 19th century title: Canoe and Boat Building. A Complete Manual for Amateurs. Containing Plain and Comprehensive Directions for the Construction of Canoes, Rowing and Sailing Boats and Hunting Craft. . .With Numerous Illustrations and Fifty Plates of Working Drawings. The copy I have to hand as I write this is the 5th of many editions, published in 1891. One can find copies on the second-hand market, but they are usually shorn of their plates. These 50 large-format drawings were sold in a separate folder, printed on very thin, almost tissue-paper-like stock, and most have not survived. Mystic Seaport Museum performed a great public service in 1987 when they compiled and published a complete set of plates, at the original size, from two original editions of the book. Canoe and Boat Building has been reprinted in paperback by Dover, that indefatigable reviver of out-of-print materials. You can also read a scanned copy of the 9th edition, along with the original plates, at the website of Dragonfly Canoes. This book could be a litmus test for whether you are the least bit interested in small boats and boatbuilding. If you think you are, I defy you to read through even the first chapter and not want to head straight for the workshop, and/or the lumberyard, to start a project right away. Canoe and Boat Building is an almost inexhaustible well to which I return regularly for advice, inspiration or simply daydreaming. An added bonus for me is that the greater part of the book is given over to the building of decked sailing canoes, of which Stephens was one of the chief American exponents. Though there are some classic examples of sneakboxes, canoe yawls, sailing skiffs and a handsome little Delaware River Tuckup, it’s pretty much all sailing canoes, all the time. The writing is characteristic of Stephens and his late Victorian age. It is sensible, practical, energetic and straightforward, and assumes that you want to roll up your sleeves and get on with it. In 18 chapters, an appendix and descriptions of the plates, Stephens gives you all that you need to know about building a sailing canoe, from making a model through lofting, building methods, rigging, rudders and centerboards and finally canoe-cruising accessories such as tents, stoves and camp beds. While the gear you take with you (and what you pay for it!) has changed, much of Stephens’ basic advice about laying down, building and rigging is as fresh and useful as the day it was written. Stephens was involved in recreational canoe sailing and travelling from its earliest days, and in addition to its other virtues, Canoe and Boat Building is a history of the sport written by someone who was not only there but in it up to his ears. The decked sailing canoes illustrated in the plates, from Stephens’ own Shadow-model canoe Dot through the British Invasion Nautilus and Pearl boats of Warington Baden Powell and E.B. Tredwen to Robert Gibson’s game-changing Vesper and later developments such as Pecowsic, are a hall of fame of the most significant sailing canoe designs of the late 19th century. Canoe and Boat Building is a book well worth owning and reading repeatedly for anyone interested the history of recreational small craft in North America and also, of course, the wonderful sport of canoe sailing. 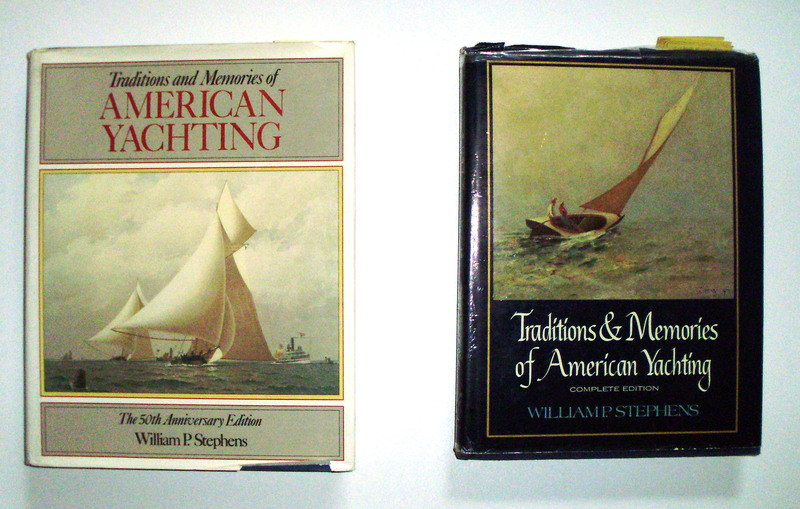 In the next post I’ll talk about Stephens’ other monumental work: Traditions and Memories of American Yachting. Until then. . .